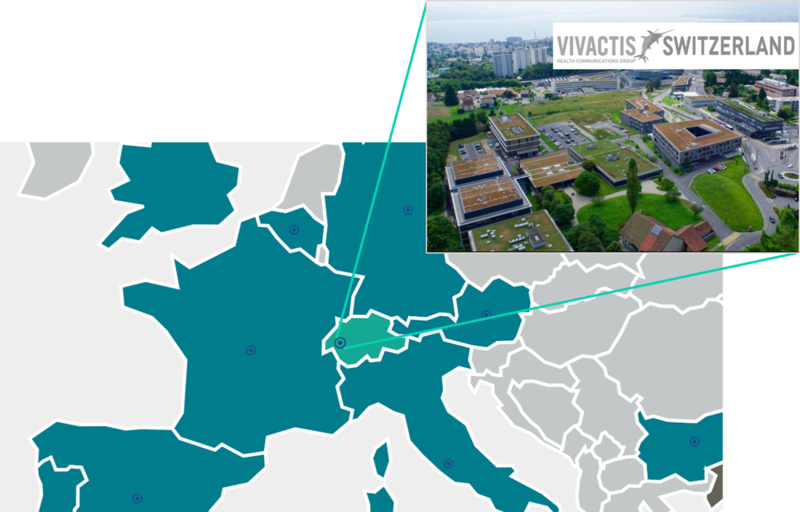 Vivactis Switzerland is part of Vivactis Group and Vivactis Global Health, the world’s largest independent healthcare communications network. Vivactis works for global, regional, and local accounts in the fields of pharma, biotech, medtech, medical nutrition, digital health, healthcare and consumer care. ​Why work with Vivactis Switzerland? Switzerland represents on its own a “mini European market”﻿ with German, French, ﻿and Italian cultures and languages. We can help you launch your product(s) on the Swiss market before reaching out to the European market. From Switzerland, we can also assist you with your European product launches, in collaboration with our colleagues from Vivactis Group, located in all the important European markets. We are located at the Biopôle, a life sciences hub near Lausanne, in the heart of the Swiss Health Valley, gathering a very high level of experts, researchers and industry players from the life sciences sector. You can benefit from our local network and our experience of collaborating with diverse biomedical actors. We are also used to work with SMEs and start-ups and, as such, perfectly understand their needs and constraints. Furthermore, you can benefit from the Vivactis Group’s expertise and global presence, especially for projects with an international span.